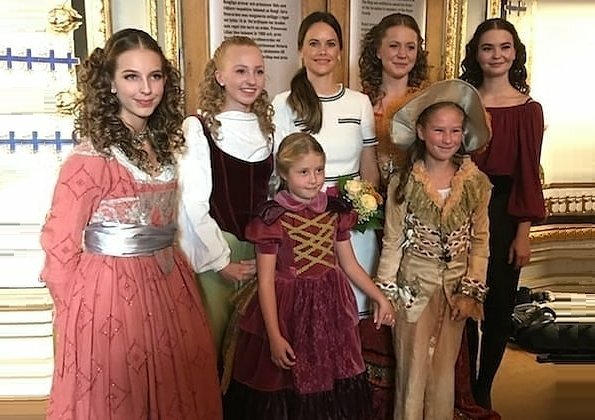 Princess Sofia of Sweden watched BASE23's dance performance about Queen Kristina at the Royal Palace Kingdom Hall (Rikssalen) and met with the dancers after the performance. Princess Sofia wore a new dress by LK BENNETT. Lovely! Sophia has the perfect figure for this clean line style dress. I love these traditional costumes! 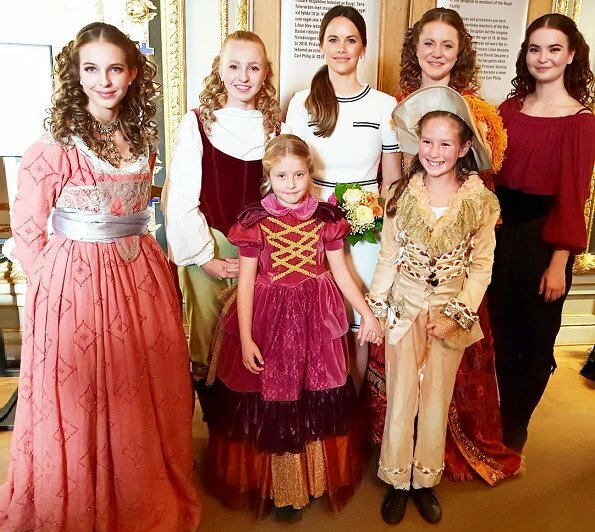 The young brunette lady in the pink dress (left) looks like Cinderella! And Sofia looks very pretty too! Excellent choice for her this time. Great look for this event. The dancers in their costumes are great as well. I think that the dancers represent the Swedish Queen Christina (talk about girl power, she was quite something!) in different ages. Sofia looks lovely here. Oh, dancers have very pretty costumes and hairstyles. Sofia's dress looks very elegant. Her hairstyle looks too girlish on woman of 30+ but neverless great look.